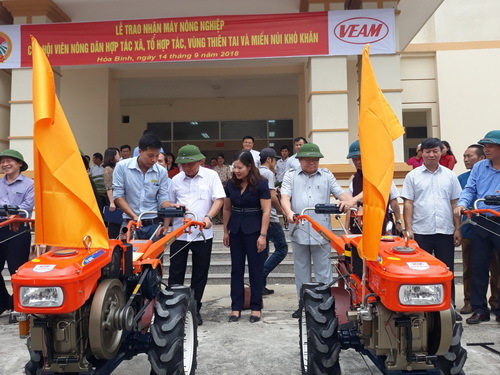 (VNFU Website) – In the morning of 14th September 2018, at Centre for Vocational Training and Supporting Farmerst in Hoa Binh Province, VNFU in collaboration with Vietnam Engine and Agricultural Machinery Corporation (VEAM CORP) gave 15 agricultural machines for members, farmers, cooperative groups and cooperatives in Hoa Binh Province. 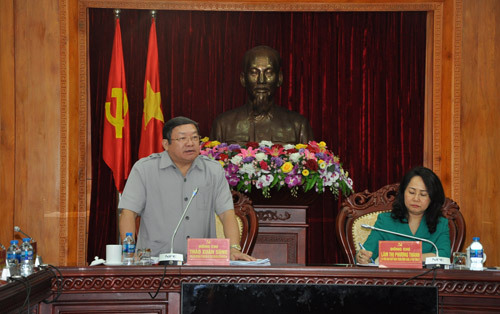 Member of Central Party Committee, Chairman of VNFU - Dr. Thao Xuan Sung presents agricultural machines to farmers. Attending at the ceremony, there were Dr. Thao Xuan Sung - Member of Central Party Committee, Chairman of VNFU, Mr. Bui Van Tinh - Member of Central Party Committee, Provincial Party Committee Secretary, and representatives of the Provincial FU and leaders of some provincial departments. 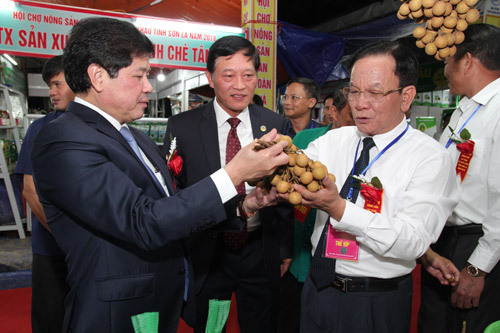 A total of 15 agricultural machines valued at 240 million VND were handed over to disadvantaged farmers, cooperative groups and cooperatives in districts of Kim Boi, Lac Son, Luong Son, Tan Lac, Da Bac and Hoa Binh city. These machine are suitable for the cultivation conditions in mountainous landform, terraced fields in Hoa Binh Province. 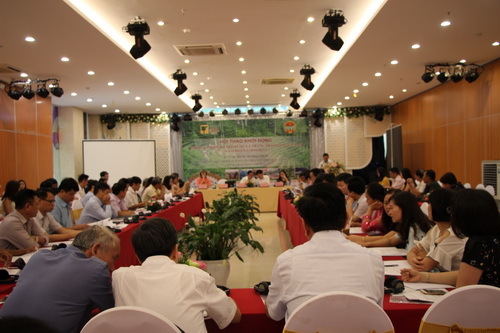 This move is a part of a joint program between VNFU and VEAM CORP on propagandizing, mobilizing and supporting farmers in using machinery in processing and preserving agricultural products, term 2016-2020. Addressing at the ceremony, Dr. Thao Xuan Sung emphasized that VNFU always accompanied and supported farmers in the country in general and Hoa Binh Province in particular in agricultural production, economic development. 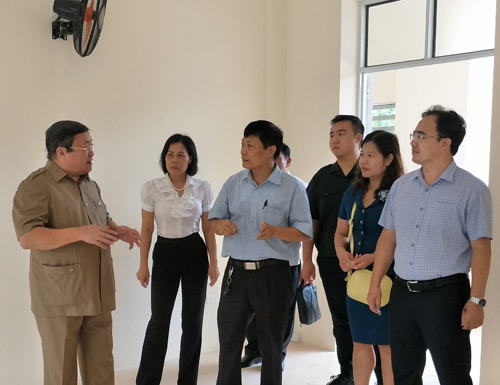 Dr. Thao Xuan Sung also expressed his hope that members, farmers in Hoa Binh Province would continue to accelerate the application of scientific and technology advances, step by step modernize and bring machinery into production, contribute to increase income , reduce poverty and enrich sustainably. 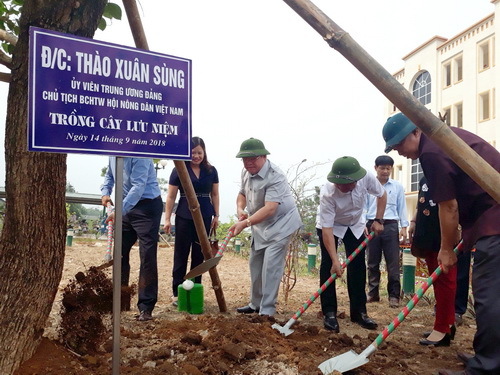 Chairman of VNFU – Dr. Thao Xuan Sung and Provincial Party Committee Secretary Mr. Bui Van Tinh planted commemorative trees at the Centre for Vocational Training and Supporting Farmers in Hoa Binh Province. Also on this occasion, Dr. Thao Xuan Sung – Chairman of VNFU and Mr. Bui Van Tinh – Provincial Party Committee Secretary planted commemorative trees at the Centre for Vocational Training and Supporting Farmers in Hoa Binh Province. For the same purposes, VNFU, in collaboration with VEAM CORP, is also going to present agricultural machines to farmers, cooperative groups and cooperatives suffering from the recent natural disasters in provinces of Lao Cai, Son La, Lai Chau and Dien Bien in the next few days.